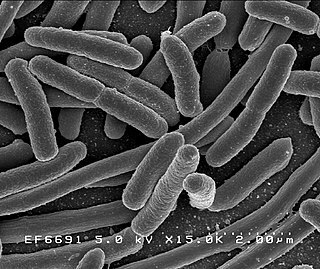 Pseudomonas chlororaphis is a bacterium used as a soil inoculant in agriculture and horticulture. It can act as a biocontrol agent against certain fungal plant pathogens via production of phenazine-type antibiotics. Based on 16S rRNA analysis, similar species have been placed in its group. Pseudomonas ficuserectae is a nonfluorescent, Gram-negative, soil bacterium that causes bacterial leaf spot on a Japanese fig, from which it derives its name. Based on 16S rRNA analysis, P. ficuserectae has been placed in the P. syringae group. Pseudomonas marginalis is a soil bacterium that can cause soft rots of plant tissues. It infects poinsettia, lettuce, and crucifers. Pseudomonas meliae is a fluorescent, Gram-negative, soil bacterium that causes bacterial gall of the chinaberry, from which it derives its name. Based on 16S rRNA analysis, P. meliae has been placed in the Pseudomonas syringae group. Genotypic characteristics of the causal agent of chinaberry gall were determined by Aeini and Taghavi. Pseudomonas denitrificans is a Gram-negative aerobic organism bacterium that performs denitrification. It was first isolated from garden soil in Vienna, Austria. It synthesizes vitamin B12. Based on 16S rRNA analysis, P. denitrificans has been placed in the P. pertucinogena group. Pseudomonas oleovorans is a Gram-negative, methylotrophic bacterium that is a source of rubredoxin. It was first isolated in water-oil emulsions used as lubricants and cooling agents for cutting metals. Based on 16S rRNA analysis, P. oleovorans has been placed in the P. aeruginosa group. Pseudomonas flavescens is a Gram-negative bacterium that causes blight cankers on walnut trees. Based on 16S rRNA analysis, P. flavescens has been placed in the P. aeruginosa group. Pseudomonas synxantha is a fluorescent rhizosphere bacterium with nematicidal properties. Based on 16S rRNA analysis, P. synxantha has been placed in the P. fluorescens group. Pseudomonas straminea is a Gram-negative, rod bacterium that includes strains formerly identified as P. ochracea. Based on 16S rRNA analysis, P. straminea has been placed in the P. aeruginosa group. Pseudomonas aurantiaca is an orange Gram-negative soil bacterium, originally isolated from the rhizosphere soil of potatoes. It produces di-2,4-diacetylfluoroglucylmethan, which is antibiotically active against Gram-positive organisms. It has shown potential for use as a biocontrol agent against plant-pathogenic microbes. Based on 16S rRNA analysis, P. aurantiaca has been placed in the P. chlororaphis group. Pseudomonas lundensis is a Gram-negative, rod-shaped bacterium that often causes spoilage of milk, cheese, meat, and fish. Based on 16S rRNA analysis, P. lundensis has been placed in the P. chlororaphis group. Pseudomonas taetrolens is a Gram-negative, nonsporulating, motile, rod-shaped bacterium that causes mustiness in eggs. Based on 16S rRNA analysis, P. taetrolens has been placed in the P. chlororaphis group. Pseudomonas gessardii is a fluorescent, Gram-negative, rod-shaped bacterium isolated from natural mineral waters in France. Based on 16S rRNA analysis, P. gessardii has been placed in the P. fluorescens group. Pseudomonas azotoformans is a Gram-negative bacterium that infects cereal grains—especially rice. Based on 16S rRNA analysis, P. azotoformans has been placed in the P. fluorescens group. Pseudomonas nitroreducens is an aerobic, Gram-negative soil bacterium first isolated from oil brine in Japan. It is able to synthesise polyhydroxybutyrate homopolymer from medium chain length fatty acids. Based on 16S rRNA analysis, P. nitroreducens has been placed in the P. aeruginosa group. Afipia is a genus of bacteria from the family of Bradyrhizobiaceae. 'Pseudomonas' boreopolis is a species of Gram-negative proteobacteria. Following 16S rRNA phylogenetic analysis, it was determined that 'P.' boreopolis belonged in the Xanthomonas—Xylella rRNA lineage. It has not yet been further classified. 'Pseudomonas' carboxydohydrogena is a species of Gram-negative proteobacteria. Following 16S rRNA phylogenetic analysis, it was determined that 'P.' carboxydohydrogena belonged in the Bradyrhizobium rRNA lineage. It has not yet been further classified. ↑ Anzai; Kim, H; Park, JY; Wakabayashi, H; Oyaizu, H; et al. (Jul 2000). "Phylogenetic affiliation of the pseudomonads based on 16S rRNA sequence". Int J Syst Evol Microbiol. 50 (4): 1563–89. doi:10.1099/00207713-50-4-1563. PMID 10939664. Wikimedia Commons has media related to Xanthomonadaceae .